Precisely like his predecessor, President Obama empowers a pro-western Murder Inc. in Black Africa, a roster that includes the most vicious mass murderers and assassins on the continent. One of them, Rwanda’s Paul Kagame, who is culpable in the death of millions in Congo, recently held an election in which he got 93 percent of the vote. But you won’t hear any complaints from the White House. One of the United States’ main allies in Black Africa recently declared himself the winner of a farcical presidential election with 93 percent of the vote. But there will be no outcry from Hillary Clinton’s State Department or Barack Obama’s White House, or even much of a fuss from the New York Times, because President Paul Kagame, of Rwanda, serves U.S. interests. You will never hear western governments and media call Kagame by his true name: a dictator and warlord from the minority Tutsi tribe that holds sway over the majority Hutu population through a reign of terror. Instead, western capitalists shower his regime with money and high praise as an example of how Africa should be governed. Paul Kagame and his mentor and fellow warlord in neighboring Uganda, President Woseri Museveni, were given the green light by the West to kill and steal at will in Central Africa. They are the two main architects of the genocide in the eastern Congo, where some estimate six million people have died since Rwanda and Uganda invaded the region, in the mid-Nineties. The soldiers of these two U.S. henchmen are still there, in the Democratic Republic of Congo, looting precious minerals for sale to multinational corporations under cover of tribal warfare – wars created and nurtured by Kagame and Museveni, themselves, for the sake of power and profit and the favor of the United States and Europe. Kagame and Museveni have more blood on their hands than any combination of men in Africa – which makes them heroes to the West. Compared to the Congolese genocide, stealing an election in Rwanda is child’s play. The majority of the Hutu population lives in terror of the Tutsi-dominated regime, which is rooted in the guerilla army that invaded Rwanda from its bases in Uganda and set off the genocidal tribal violence that killed hundreds of thousands of Tutsi and Hutus – although the Hutu victims of Paul Kagame’s army must be mourned in silence. It is a crime in Rwanda to even raise the question of mass killings of Hutus during the violence of 1994, as Kagame fought his way to power. Indeed, any criticism of Kagame’s regime is guaranteed to get one branded as a genocidaire – an advocate of genocide – or a proponent of “divisionism,” which means saying anything that might tend to undermine the people’s obedience to Paul Kagame. You might just turn up dead, as did several of the regime’s opponents in the run-up to the sham election. No serious opposition was allowed to compete. 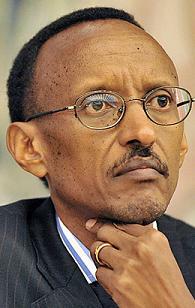 The Kagame police state has ways to ensure that almost everyone votes for The Leader. Voters mark their ballots with their fingerprints next to the chosen candidate, so no one’s vote is a secret. The two African heads of state most despised by the United States, Robert Mugabe of Zimbabwe, and Omar al-Bashir of Sudan, have held elections that were far more fair and credible than Rwanda’s Paul Kagame. Presidents Mugabe and Bashir would never arrange for themselves to get 93 percent of the vote, because they would be denounced as vote thieves by the West. But the genocidal dictator and Paul Kagame flaunts his disregard for the democratic processes, and the West loves him for it. He is doing the U.S. and Europe’s killing for them, and they are pleased. For Black Agenda Radio, I’m Glen Ford. On the web, go to www.BlackAgendaReport.com.